Even though the 52-mile section between Exeter and Plymouth, England was only partly completed, Brunel's Atmospheric Railway was the most extensive ever built. Known to locals as the 'Atmospheric caper' it was plagued by problems from the start. Initial tests showed that the original 12" (30cm) pipe needed to be replaced by one of 15" (38cm). 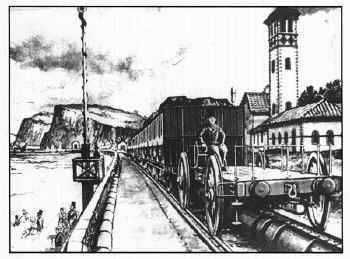 This meant that the pumping engines already installed along the route had to run faster than their design speed in order to exhaust the pipe sufficiently. The first passenger trains eventually ran in September 1847. There were frequent breakdowns, which resulted in third class passengers having to get out and push. The main problem though, was the leather sealing valve, which rapidly deteriorated. (There was no other suitable flexible material available in the mid 1800's.) When it was discovered that the whole valve needed replacing after less than a year of service at a cost of £25,000, the South Devon Railway directors abandoned the project in favour of conventional locomotives. The last atmospheric passenger train ran in September 1848. An Atmospheric Train passing the pumping house at Dawlish, Devon, 1887. Source unknown. The pipes were cast too roughly, the steam engine pumps kept breaking down, and the leather valve along the pipe, was eaten by rats. Despite these problems, the Atmospheric Railway ran quite well towards the end of its life, and was a firm favourite with the passengers - except maybe those in third class. During the Spring and Summer of 1848 nine trains a day were running between Exeter and Teignmouth and average speeds of 64 mph (103 kph) were attained. The highest speed recorded was 70 mph (112 kph) with a train of 28 tons (28,450kg). The map shows the section of the South Devon Railway on which Brunel applied the Atmospheric System. Steam powered pumps were installed in engine houses at the places marked in red. Each engine house contained two 41.5 h.p (31 kW) vertical vacuum pumping engines fed with steam from boilers at 40lbs/square inch. (2.8 bar). They were designed to run independently to allow maintenance, though in practice they had to run coupled, and at top speed -to the dismay of the boilermen who had to keep shoveling the coal- in order to compensate for the leaky leather valve. The distance between successive pumping stations was around 3 miles (4.8km). 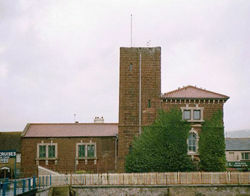 Additional pumping houses were built at Torquay and Totnes, though engines were never installed.